If you are preparing to install macOS on multiple computers, one of the things that can make your life simpler (and the waiting shorter) is a bootable USB installer. The idea of the installer is that you only need to download the macOS Installer.app from the App Store once. Usually, when you run the installer after downloading it, it’ll delete itself and you have to go through the whole download process again on each machine or disk that you want to install macOS onto. By making a bootable USB drive, you simply plug the drive in to your mac, launch the installer app and tell it where to install the OS. You can repeat this as many times as you like as the installer will remain safe on your USB. 1. Download the macOS Installer from the App Store. 2. Run the createinstallmedia command from the Terminal, an AppleScript or a helper app. 3. Reboot your mac, choosing the newly created USB as the startup disk. 4. Run the installer.app from the USB. Step 2 is where the fun is. The createinstallmedia command can be tricky to get right, particularly if you’re not familiar with working on the command line. For those of you that are, follow Apple’s instructions here. For a little more convenience, I wrapped all that inside an AppleScript which will first ask you for the location of the installer, then ask you to choose the USB target. For maximum convenience, I also wrote a free little Swift app I’ve dubbed ‘Boot Buddy‘ (cos “Create bootable macOS Installer Drive.app” just didn’t quite have the right ring to it..!) that will present the whole thing in a neat little user interface. Three clicks, more or less, and you’re done. Boot Buddy doesn’t require an admin password to install, but you do need to provide an admin password to actually create the bootable installer as the createinstallmedia process has to be run as root. Boot Buddy doesn’t see or use this in any way whatsoever other than to start the createinstallmedia process or to cancel it (if you choose to do so); authorisation is handed off to macOS to take care of. Boot Buddy requires macOS 10.11 or higher and can create bootable USBs from Mavericks, Yosemite, El Capitan, Sierra and High Sierra installer apps. If you’re finding that the large blue location circle is obscuring your view of your current location, here’s a quick script that will allow you to toggle it on and off. You could create a Service and then a hotkey for it, or save the script as an Application and add it to your Dock. That’ll give you a one-click method for toggling the circle on and off – you can also turn it back on (but not off! ), just by clicking the usual Location button in Maps’ user interface. Starting with 10.10.4, you can now enable Trim for 3rd party disks without resorting to 3rd party tools. 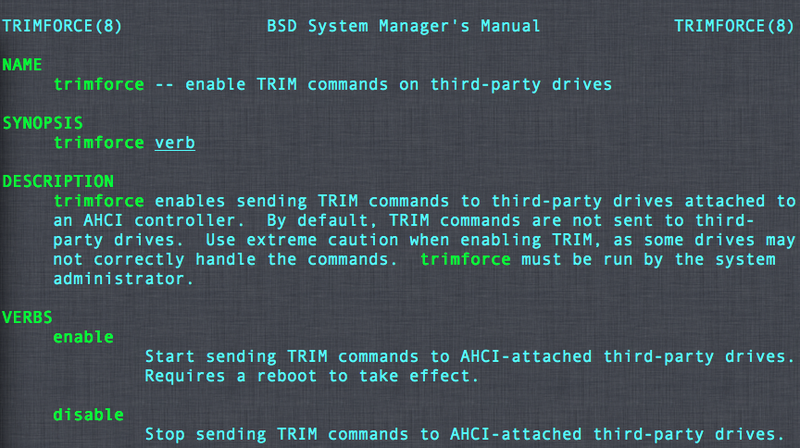 Apple have included a new command line utility called trimforce. Beware, the name was not picked acccidentally. Trimforce forces TRIM activation on all 3rd party SSDs regardless of whether they support it or not, so use at your own discretion. Generally, it should be safe to use if your disk manufacturer recommends having TRIM turned on, but only your own testing will confirm that. As always, be sure you have full and regular backups of your disks in case of data corruption. display dialog "No images selected!" buttons "OK"
display dialog "Create a new album with name" default answer "Imports"